Buenos Aires is known for nightlife, museums, parks, historic sites, and shopping. Your plan includes some of its best attractions: don't miss a visit to Recoleta Cemetery, admire the striking features of El Ateneo Grand Splendid, get to know the fascinating history of San Telmo, and wander the streets of Puerto Madero. To see reviews, where to stay, and tourist information, read our Buenos Aires travel route tool . Rio de Janeiro, Brazil to Buenos Aires is an approximately 7-hour flight. You can also drive; or take a bus. Traveling from Rio de Janeiro in February, expect Buenos Aires to be little chillier, temps between 32°C and 24°C. Finish up your sightseeing early on the 8th (Fri) so you can travel to San Carlos de Bariloche. 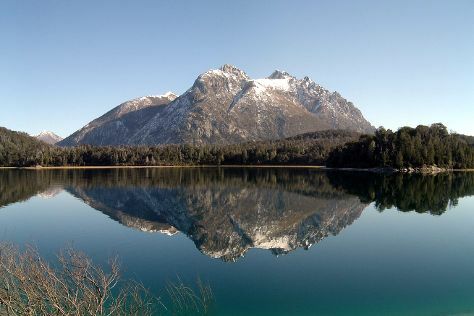 San Carlos de Bariloche is known for nature, winter sports, trails, wildlife, and historic sites. Your plan includes some of its best attractions: take in panoramic vistas at Parque Nacional Nahuel Huapi, look for gifts at VanWynsberghe Chocolats, stroll through Cerro Otto, and pause for some photo ops at Centro Civico. Planning San Carlos de Bariloche trip won't be overwheling when you use's Insprock itinerary maker. Traveling by flight from Buenos Aires to San Carlos de Bariloche takes 5.5 hours. Alternatively, you can drive; or take a bus. Traveling from Buenos Aires in February, expect nights in San Carlos de Bariloche to be much colder, around 7°C, while days are slightly colder, around 27°C. Wrap up your sightseeing on the 12th (Tue) early enough to travel to Sao Paulo. Sao Paulo is known for museums, shopping, parks, nightlife, and historic sites. Your plan includes some of its best attractions: stroll through Ibirapuera Park, pick up some local products at Mercadao - Sao Paulo Municipal Market, wander the streets of Paulista Avenue, and have some family-friendly fun at Pixel Realidade Virtual Arcade VR. To find more things to do, maps, photos, and tourist information, you can read our Sao Paulo journey planner . You can fly from San Carlos de Bariloche to Sao Paulo in 10 hours. Other options are to do a combination of flight and bus; or drive. Expect a bit warmer weather when traveling from San Carlos de Bariloche in February: highs in Sao Paulo hover around 34°C, while lows dip to 23°C. Finish your sightseeing early on the 16th (Sat) to allow enough time to travel back home.